Parents and others in the community have an excellent opportunity to learn how to keep our children safe from Internet dangers when a NetSmartz program is held this Thursday at 7 p.m. at the South Cumberland Library. NetSmartz is an interactive, educational safety resource from the National Center for Missing and Exploited Children and the Boys & Girls Clubs of America. Intended for children ages 5 to 17, parents, guardians, educators and law enforcement workers, the program aims to teach children how to stay safer on the Internet. Thursday's program is designed specifically for parents. 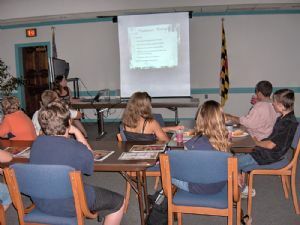 Earlier this month, the library system held a similar program for teen-aged users of the Internet. "It is very important that parents and other adults in our community understand how kids are using the Internet and how adults can help ensure the child's safety online," Linda Burkey, library coordinator of community outreach, said. The program is designed from an adult perspective and will have information about online risks and how to avoid them, tips for keeping children safer, and statistics and resources parents can access from home. All of us have read about children, and adults, who have gotten into dangerous situations through Internet interactions with strangers. Thursday's program may go a long way to helping parents to make sure their children are aware the do's and don'ts of Internet use.